Mid 65 ES-335 with chrome hardware. What pickups should be in this guitar? If you polled 100 players, I would bet that 60 would say T-tops. Not even close. Don’t believe everything you read on the internet. How many 65’s have you taken apart? Just when you think you know it all, it turns out that you don’t. I thought I had seen enough 335’s (345’s and 355’s) to have a good handle on when and how the various parts evolved and when various changes were made. And, while the only real consistency at Gibson is inconsistency, sometimes I get a surprise. Sometimes, it’s a pleasant surprise. We’re talking about pickups and the disconnect between the conventional wisdom and actual observation. I’ve been on about this before with regard to T-tops-the conventional wisdom says they started in 65 but that is wrong (and that’s another post). Most of us know the PAF timeline. Started in late 56 with steels and into guitars in 57. Covers changed by 58 from stainless to nickel plated. Long magnets until some time in 61. Whites and zebras from mid 59 to around mid 60 in nickel PAFs but into 61 in gold versions. Short magnets from late 61 or so (there was overlap) up to 63 and rarely 64 in nickel PAFs. I’ve never seen a gold PAF later than 64 but others have. I’ve heard of PAFs as late as 67 in gold models but I’ve never seen it myself and I’m skeptical. But, mostly, everybody agrees about PAFs. Patent numbers are another story. Patent numbers appeared in 62 and were often mixed with PAFs. Many 62’s and 63’s have one PAF and one patent number. Everybody knows the only difference is the sticker. Here’s where the conventional wisdom goes off the rails. Early patents have 2 black leads and enamel coated windings (and a short A5 magnet). The next version had one white and one black lead and poly coated windings. It is widely believed that the poly windings showed up in 64. They didn’t. Now, I don’t pull the covers on pickups that have never been opened but I usually do if the solder is not original. Taking the covers off was really common in the late 60’s, so I’ve pulled a lot of covers. I’ve never, ever-not once-seen a poly wound patent number under a nickel cover. If I’m correct, then poly windings began some time in 65. But wait–the conventional wisdom says T-tops started in 65. If poly windings just came in in 65, it doesn’t make sense that T-tops showed up at the same time. That’s because they didn’t. 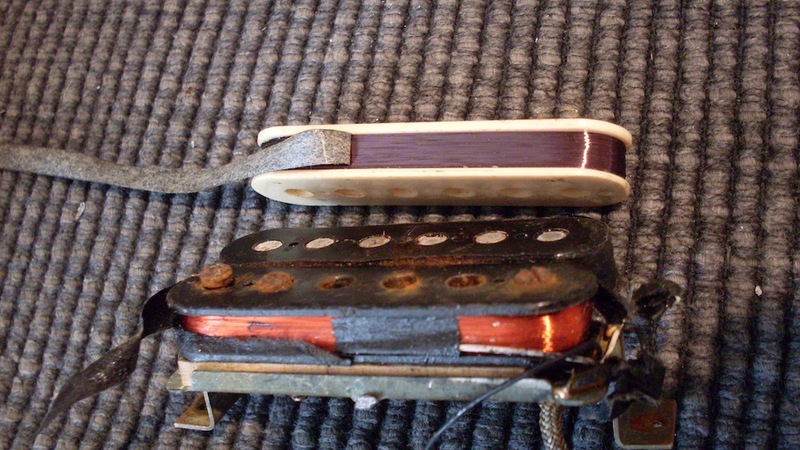 The first 65’s had nickel covered pickups and they were enamel wound. I found, through looking at a lot of 65’s that if the cover was nickel, the windings were enamel coated and, if chrome, the windings were poly. Not so fast…I recently bought a beater 65 and I decided to part it out. It was a mid 65, SN 332xxx. Wide nut but all chrome parts. I pulled the harness and noted early 65 pot codes and completely undisturbed solder, so I knew the pickups had never been out of the guitar. 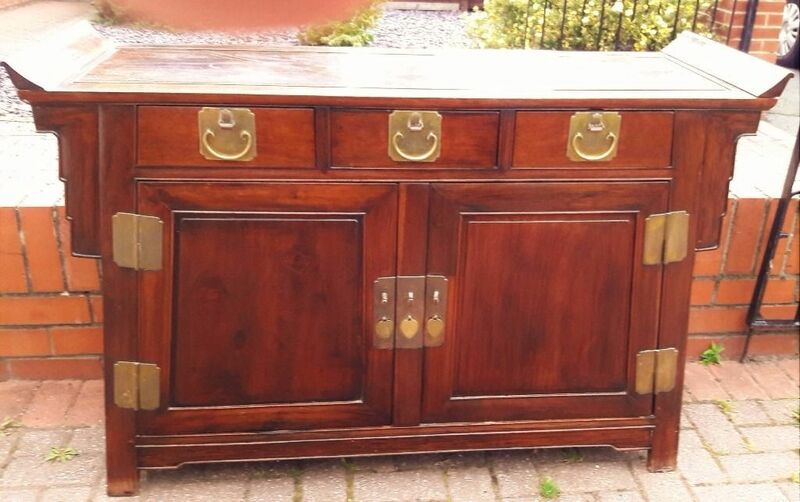 One pickup had been opened but the other was sealed. I fully expected to see one white lead and one black lead and poly coated (orange) windings. Nope. Enamel (purple) windings and two black leads. That is, essentially, a short magnet PAF with a different sticker in a 1965 chrome hardware 335. No wonder some 65’s sound so good. I’ve seen enough 65’s (probably 40 of them) to know that most of them have the later patent numbers but, as I now know, not all of them. The value of early patent numbers has crept up in recent days and many parts dealers are asking as much as $2000 for one. I think that’s optimistic (OK, it’s nuts) but I think everybody overprices their parts. The problem is that it’s impossible to know what’s in there without pulling the covers. A 65 ES-335 can cost anywhere from $4500 (for a late narrow nut 65 with issues) to as high as $15000 for an early 65 with a stop tail. I don’t recommend you go out and buy the next 65 that comes up for sale thinking it’s going to have the equivalent of a PAF because it probably won’t. But it could. For the record, there are plenty of 65’s with poly coated windings – most of them, in fact. This guitar with the early patents may be a bit of a fluke. 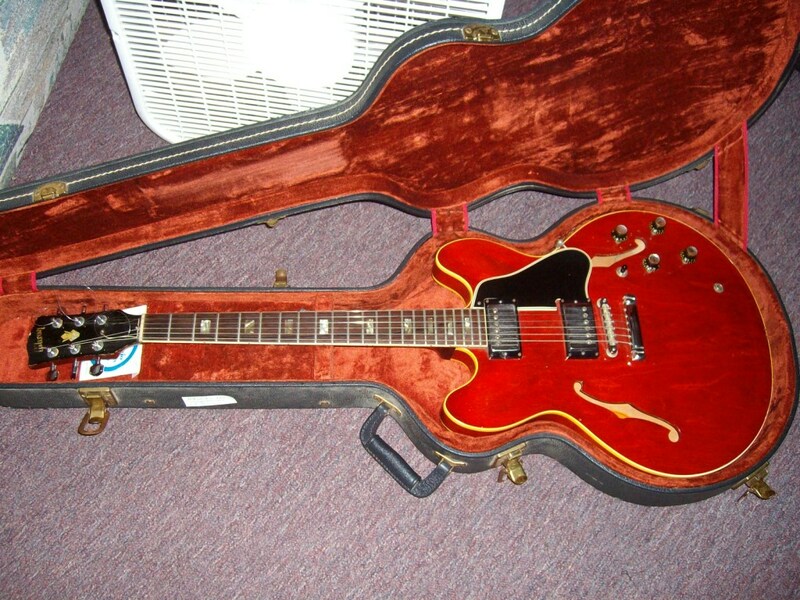 Moving forward, I recently picked up a 69 ES-340, which is a 335 with a badly conceived circuit. I opened that one up and found not T-tops as you might expect but later patent numbers (poly). I’ve found them in many 68’s, many 67’s and most 66’s. The best I can estimate is that T-tops arrived some time in 66 but weren’t common until 67. I don’t see all that many post 65’s but I see enough to get a sense of what’s in there. If you buy a 67 or a 68, you still have a really good chance of getting pre T-top patent numbers. If you can’t (or won’t) pull the cover, then there is another not terribly reliable rule. The bobbin screws can tell you something. If they are Phillips, then the pickup is more likely a pre T but it could be a T-top. If they are slotted, it is almost certain that it is a T-top. You can also measure the DC resistance. Most t-tops are the same 7.47-7.52K. If you have slotted screws and both pickups are in that range, you likely have T-tops. Or just use your ears. If you like the sound, don’t worry about which version it is. If you don’t, then change them. Enamel coated wire is purplish to brown and poly coated wire is orange to red. You would expect poly in 65 and that’s what most 65’s have. 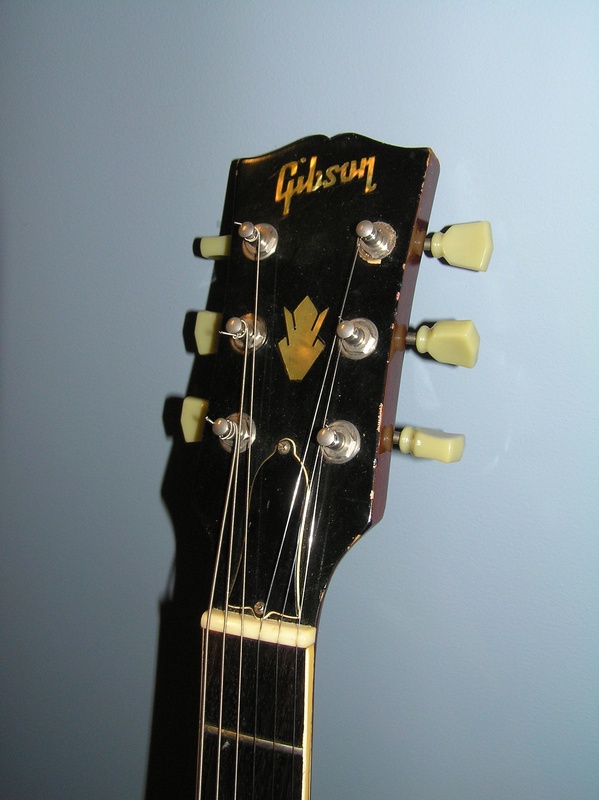 But, if you get lucky, you might find the enamel windings on your 65. That, but for the decal, is a PAF. There is no way to know for sure without pulling the cover. And nobody knows if you know anything about guitars but it doesn’t stop some folks from acting like they do. The internet is a funny place. Sometime ha-ha funny, sometimes peculiar funny. I don’t, as a rule, spend too much time in places like forums or social media but I will occasionally nose around to see what folks are talking about. Mostly, it’s current events or politics but sometimes, it’s guitar related stuff. I shouldn’t be surprised and I shouldn’t be annoyed or upset but sometimes it’s surprising, annoying and upsetting. 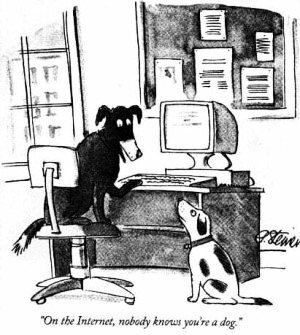 There was once a cartoon of two dogs at a computer and one says to the other “on the internet nobody knows you’re a dog”. True enough. But it is also true that on the internet, nobody knows you’re a complete idiot. Except when they do. They switched to block markers in 1961. Wire ABR-1’s came in in 1963. The nut width went back to 1 11/16″ in 1968. All 60’s 335’s have “Union Made” on the orange label. T-tops were standard starting in 1965. All 335’s before 1964 have a solid center block. All of the above “facts” are wrong and were stated by someone as true. The problem is that you don’t generally know who posts this stuff and you it’s hard to ascertain what’s true and what isn’t. The lesson here is that you shouldn’t use internet forums as a learning center. Fortunately, folks who know the facts often call out the poster of “alternative facts” as not knowing what they’re talking about. But, too often, nobody says anything, so Joe Neophyte, who’s trying to learn about 335’s takes it as fact. I have had dozens of emails disputing my claim that the nut width didn’t go back to 1 11/16″ in 1968. This is kind of a special case since this “information” was posted on a very accurate and very useful website about vintage guitars. It is where I got a lot of my non 335 knowledge from. But it’s wrong. 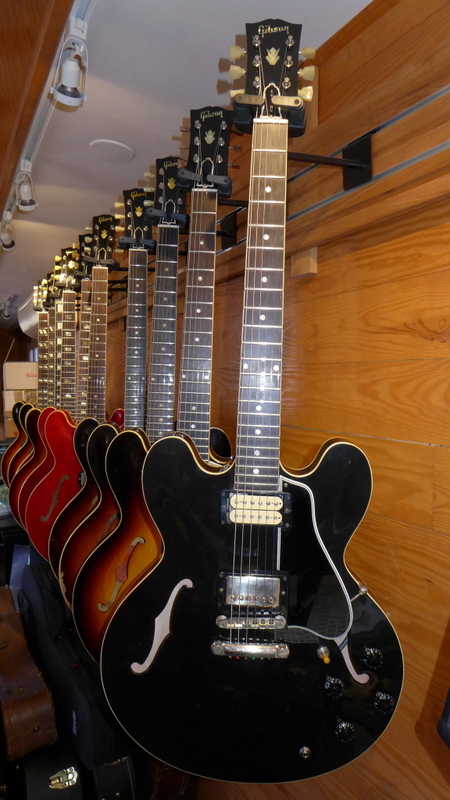 My 335 (and 345 and 355) knowledge comes from looking at real guitars over a period of many years. And I’m not always right because, on occasion, I’ll see something in a real 335 in my possession that breaks a rule and I have to amend my “facts”. To make matters worse, the misinformation gets repeated by folks who read it somewhere and didn’t question it. So, eventually, it pops up in enough places that you figure it must be true because you’ve seen it ten different times in ten different places. Unfortunately, the wrong “facts” get repeated just as often as the true ones. So, why don’t I call out the purveyors of alternative facts? The truth is that I used to but eventually I got a little tired of being the internet 335 police. I remember, early on, seeing Ebay listings that had the year wrong and a completely inaccurate description and I would diligently write to the seller and set them straight. The response was, occasionally, “oh, thank you so much. I had no idea that the 12 holes in the back weren’t factory.” More often, it was, …”who the hell are you and what makes you think you know more than I do?” That gets pretty old. So, I stopped correcting those who are in need of correction. Much as I’d like to be, it’s simply too much work to be the 335 police, so be careful where you get your information and, more importantly, be careful who you buy from. There are literally 100 things that can be wrong with an electric guitar. I don’t expect anyone to know everything but if you want to know the important stuff, I’ve probably covered it in a post. Use the search function and if that doesn’t find you what you’re looking for, send me an email and I’ll tell you the truth, assuming I know it. Oh, and the switch to block markers was early 62, wire ABR-1’s were also 62, the nut width didn’t go back to 1 11/16″ in 68, 335’s from 64 until some time in 68 had “Union Made” on them and cut center blocks first appeared in 61 but weren’t the rule until 65. T-tops seem to have shown up in 66. I’ve never had a 65 with them but I haven’t owned every 65 either (and I don’t open sealed covers). I’m sure one of the experts out there has seen them in a 65. The trouble is that half the 65’s out there are actually 68’s. There’s a lot of serial number overlap between those two years and, for some reason, nearly everybody simply picks the earlier year, presumably so they can ask more money. But that’s a different post. You do get to the point where you can tell the nut width by eye. No calipers required. This is a 68. Does that look like 1 11/16″ to you. I didn’t think so.